Good morning! I’m back with another Pick Three Polishes post. In case you’re new to this series, I have so many untried polishes that I basically pick three at random, swatch them, then attempt to create nail art with them. Today I have three Formula X polishes: Aphrodite, Phenomena, and Massive. This time it wasn’t really random because I have about 30 Formula X polishes that I’ve never tried before. Aphrodite is a lavender base holographic polish. This is 2 coats plus top coat. No complaints on formula! 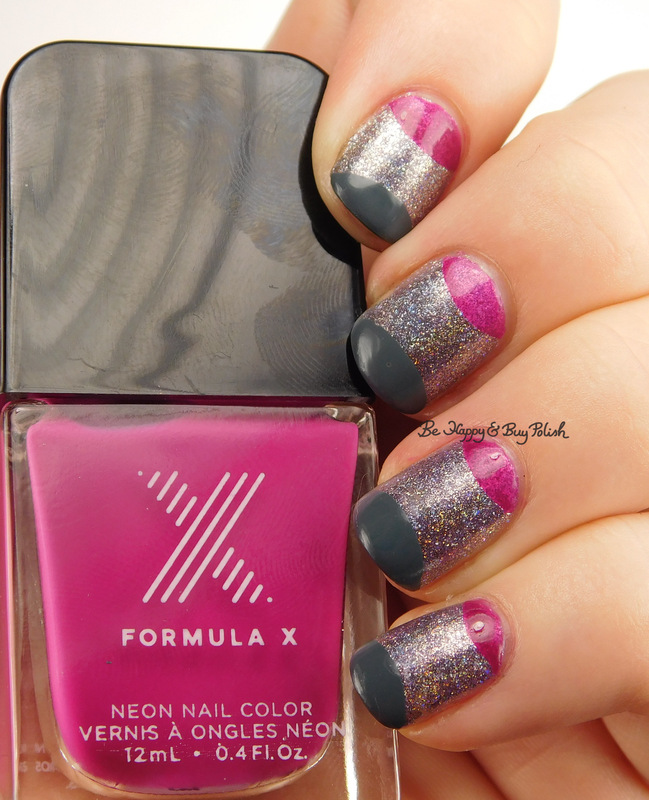 Phenomena is a sheer fuschia jelly polish. This is 3 coats plus top coat. It dries matte and is fairly uneven on its own. Massive is a OCW (one coat wonder) on my shorties! I have been loving grey polishes lately and this one just hits the spot. Formula was great. So I started with Aphrodite as my base. Then using tip guides, I created half circles at the base and tip of my nails. This is a great way to extend-a-mani as well. I adored how this came out! It definitely was an eye-catching mani that I couldn’t stop staring at. What do you think of it? If you like this, share it in a tweet! These look great together, I think the grey is the only one I would wear alone though. I like Aphrodite peeking out under the pink jelly too. All three are nice colors. i love the nail art you created with them too. Ohh, the nail art is so neat!! The colors work really well together! What a gorgeous mani! I love that holo Sephora X! Aphrodite is so pretty! Love the nail art you did too! That lavender is gorgeous! I’ve not tried that brand before. But I really love the mani you did with all of them. They are three gorgeous shades and so is the mani you created with them! Formula X’s are incredibly expensive over here and I haven’t found one that I feel I really needed to spend those money on.